Posted by bink on October 9 2003, 11:42 PM. Posted in Microsoft Corp.
Posted by bink on October 9 2003, 8:46 PM. Posted in Windows 2000. All running programs appear to stop responding, or "hang," during this pause. Posted by bink on October 9 2003, 3:27 PM. Posted in Office. 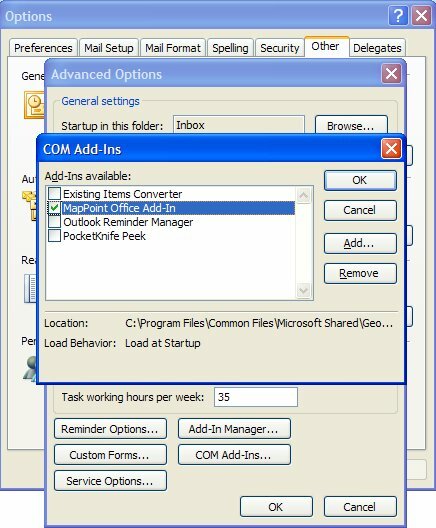 One useful but often forgotten feature of Outlook’s Contacts is the ability to map the contact’s address using MapPoint on CD or through a web site if MapPoint is not installed. When MapPoint is installed, you can create web-based maps by disabling the MapPoint Com addin by opening Tools, Options, Other, Advanced Options, Com Addins and remove the check from the MapPoint Addin. Outlook originally used maps on the Expedia website and Microsoft recently redirected the URL to mappoint.com. However, Outlook 2000 does not redirect properly and users are unable to use the external mapping service. If you use Outlook 2000 and don’t have MapPoint installed, you can edit the registry to enable another web-based mapping service. Posted by bink on October 9 2003, 3:11 PM. Posted in Security. Posted by bink on October 9 2003, 3:04 PM. Posted in Security. Microsoft plans to announce on Thursday a detailed plan to combat a recent wave of security threats, but one executive told CNET News.com things won't change overnight. "I don't think it is a big bang thing," Microsoft Senior Vice President Bob Muglia said in an interview Wednesday. "I think it's an evolutionary, multistep thing." As earlier reported, Microsoft is moving toward a strategy known as "securing the perimeter," which involves a greater reliance on firewalls and other "shields" to stop hackers from reaching potentially vulnerable PCs. Thus far, Microsoft has focused its efforts on a Trustworthy Computing initiative designed to improve the way the company writes its software as well as on finding flaws and quickly patching them as they are uncovered. However, Microsoft executives have said in recent weeks that the patch approach alone is not working, with many customers choosing not to install the latest updates to Windows, or at least not quickly enough to thwart hackers. Microsoft CEO Steve Ballmer first referred to a greater reliance on shield technology during a Sept. 15 speech before a crowd of Silicon Valley executives. The software giant has come under increasing pressure to step up its security efforts, particularly in the wake of the MS-Blast worm, also known as Blaster. In addition to concern among customers large and small, Microsoft faces a proposed class-action lawsuit in California over its security flaws. However, Muglia said Microsoft has realized that it needs to take action on more levels to try to thwart hackers. "You need to have multiple levels of defense," Muglia said, likening it to the steps one might take to secure his or her house. "You need to have a fence outside your house, sort of like a gated community," he said. "Then you need to have your doors locked and maybe you need your alarm turned on as well." Muglia stressed that security is Microsoft's top priority right now. "We are also looking at ways we can detect some, whether there is some aberrant behavior that is happening on the network, and find intruders," Muglia said. At the same time, Muglia said a lot of customers stopped the Blaster attack by using tools that are already available, such as the Internet Connection Firewall that is built into Windows. Posted by bink on October 9 2003, 2:59 PM. Posted in Tools & Utils. FRSDiag provides a graphical interface to help troubleshoot and diagnose problems with the File Replication Service (FRS). FRS is used to replicate files and folders in the SYSVOL file share on domain controllers and files in Distributed File System (DFS) targets. FRSDiag helps to gather snap-shot information about the service, perform automated tests against that data, and compile an overview of possible problems that may exist in the environment. Posted by bink on October 9 2003, 2:53 PM. Posted in Internet Explorer. Note this fix is included in October IE cumalative patch! Posted by bink on October 9 2003, 2:47 PM. Posted in SCCM (SMS). Microsoft on Wednesday announced that it's long-awaited Systems Management Server 2003 will be released to manufacturing on October 22. I Reported on last month that it will be formally released Nov. 11 at the Microsoft IT Forum 2003 in Copenhagen. The new release, formerly dubbed Topaz and over two years in coming, will emphasize greater support for mobile devices in a new Advanced Client that automatically checks the size of the connection and adjusts transfer rates accordingly. SMS 2003 will also add a much needed checkpoint/restart function that restarts a failed transmission where it left off—down to the byte level. In addition, Microsoft announced that its Microsoft Operations Manager 2004 release, announced last spring, is now in private beta testing with about two dozen customers. The software will go into public beta testing by year's end, according to David Hamilton, director of Microsoft's Enterprise Management Division in Redmond, Wash. 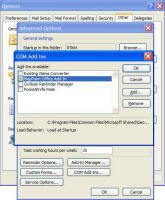 MoM 2004 will include a series of Management Packs for managing Web services components such as UDDI, ASP, .Net and IIS. It will also include an end-to-end Management Pack for monitoring services that operate across multiple applications and systems. In addition, Microsoft streamlined the tool's deployment, making it simpler to administer. Third-party Web services management providers such as Amberpoint Inc., Actional Corp. and Computer Associates International Inc. will integrate with MoM 2004, Hamilton said. Posted by bink on October 8 2003, 9:15 PM. Posted in Tools & Utils. ADTest is an Active Directory load-generation tool. It allows you to simulate client transactions on the host server. By varying client load, you can relate the transaction rate to resource utilization on the server and get some idea about the requirements for your environment. Because ADTest can perform generic Active Directory requests, it can also create an organizational unit structure inside Active Directory. You can add many organizational units and user objects in those ADTest-created organizational units. You can also add attributes to the user objects. Once you have created the Active Directory structure you require, you can use ADTest to perform various Active Directory requests, including Modify and Search. Several pre-built tests have been written to reproduce some typical activities you might want to evaluate. Examples of these pre-built tests are: an interactive logon, a batch logon, a search for a random user, and a modification of an attribute of a random user. By varying your hardware environment or other test parameters, you can gain insight into the performance sensitivities of your particular setup.Remember that benchmarking and performance exercises are useful for comparing platforms or for getting a general understanding of the hardware requirements for common implementation scenarios. However, because these tests are run in constrained environments, such as an isolated lab, they do not necessarily translate directly to deployable scenarios. Therefore, it is important to understand that while this tool is meant to help you prepare for a fairly comprehensive server-sizing and capacity-planning effort, any data generated is only meant for general sizing, benchmarking, or deployment recommendations. Note: This is not included in the win2k3 resource kit tools pack, works for Win2k domains too! Posted by bink on October 8 2003, 8:59 PM. Posted in Office. InfoPath 2003 HL7 CDA Demo is based on a doctor visit scenario where the patient is received, examined, a diagnosis is made and a medication prescribed. The demo is comporised of two InfoPath 2003 solutions, the Physician's Progress Note and the Pharmacy Order Forms. These electronic forms are based on the Health Level 7 (HL7) Clinical Document Architecture (CDA) standard and show how medical data can be retrieved, stored and transmitted electronically to streamline the paperwork normally associated with this encounter, reduce errors and imporove the quality of healthcare. Posted by bink on October 8 2003, 8:22 PM. Posted in Windows Mobile.